One of the things that I often joke about when talking about finding new historical material to study is that you can always revisit an old topic – after all, there’s a new book about the American Civil War published every hour. Of course that isn’t literally true, but there does always seem to be new material written about the Civil War. Given the vaunted place of the Civil War in American mythology, this is not surprising. Another reason for this, as explained by today’s guest, is that the Civil War produced a treasure trove of archival material that historians are still combing through 150 years later. 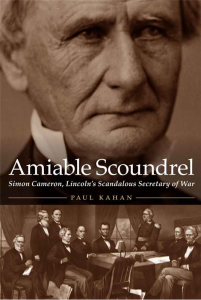 One such example is Paul Kahan’s new book Amiable Scoundrel: Simon Cameron, Lincoln’s Scandalous Secretary of War. The book traces Cameron’s career from mastering Pennsylvania’s political machine to serving in the Senate to representing the United States as a foreign diplomat. Despite this impressive resume, he is best remembered for his short stint as Lincoln’s Secretary of War and the scandals that marked his time in that office. Having lived from 1799 to 1889, Cameron’s career spanned a good deal of the 18th century and he came to be representative of his era’s political culture. In this episode of the History Slam, I welcome Paul Kahan back to the show to talk about the new book. We chat about researching the Civil War, Cameron’s personal character, and the behind-the-scenes machinations of the Lincoln administration. We also examine 19th century American political culture and the separation between politics and personal relationships.